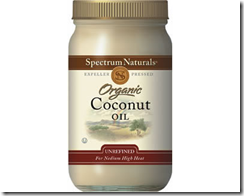 I’ve been reading about all the awesome properties of coconut oil. If you can believe what you read on the internet, it will change your life and make your pets speak Spanish and give you the ability to do the splits again. But mostly it will improve your brain power and memory- or so it claims. I thought both those talents were still okay, if not stellar, but apparently my children don’t think so. 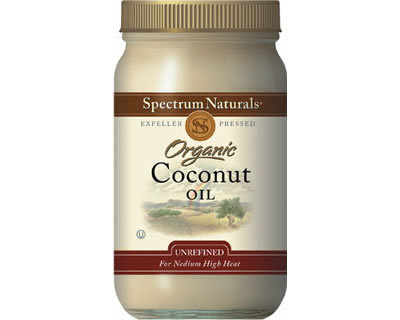 Among my Mother’s Day goodies was a big (really big) bottle of Coconut Oil which I’m slurping down like 5 o’clock martinis. Already I’m remembering things I thought I forgot. Look it up. Here’s what one site claims. 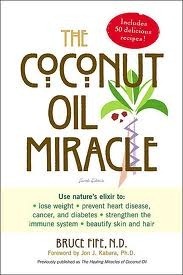 “The health benefits of coconut oil include hair care, skin care, stress relief, maintaining cholesterol levels, weight loss, increased immunity, proper digestion and metabolism. 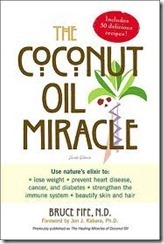 These benefits of coconut oil are attributed to the presence of lauric acid, capric acid and caprylic acid, and its properties include claims it is antimicrobial, antioxidant, antifungal, and antibacterial. It looks a little like lard, and tastes like butter. I’ve gulped down worse-tasting medicine in my life. I’ll let you know if any of these claims seem to bear out. Right now, I’m feeling a little nauseous and I’ve lost the ability to whistle. Been using it for a few months. Can’t tell any side effects. Don’t feel any smarter. Have lost a bit of weight. Have a bit more energy. Sleep better. I use it like butter. Works good in hot cereal. Fry my eggs in it. It should work as a substitute for vegetable oil. So. Approximately how much do you take a day Craig? It’s like eating Crisco so I like the idea of using it on other things. Been taking it straight up – pretty weird. My husband has been using it for several months. I am going to try to remember to check to see if it helps his memory. He seems to forget every thing I ask him to do. That may be on purpose.